Canon XF705 is a 4K camcorder that can shoot videos in HEVC H.265 codec, maybe you have recorded some HEVC H.265 videos with Canon XF705 after you got this amazing camcorder, do you want to import Canon XF705 H.265 MP4 files into Avid Media Composer and edit natively? In this article we will share the best Canon XF705 H.265 video converter with you, which can convert Canon XF705 H.265 files to Avid Media Composer native supported DNxHD codec for editing. 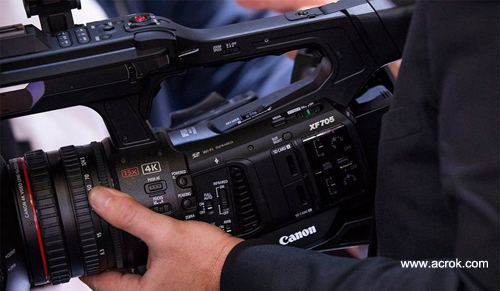 Canon XF705 4K camcorder is loved by many fans due to its powerful features. The Canon XF705 is equipped with 1″ CMOS Sensor, 15x Optical Zoom, Dual-Pixel CMOS Autofocus, 12G-SDI and HDMI Outputs and Optical and Digital Stabilization. With this powerful camcorder you can capture 4K UHD videos up to 60 fps, the recorded videos can be in H.265/HEVC Codec, 4:2:2 10-bit Color, which means you can get high quality videos easily. How to edit Canon XF705 H.265 files with Avid natively? 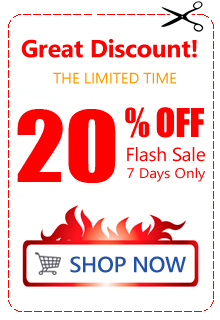 Avid Media Composer is a popular video editing software that loved by a lot of fans. If you often shoot videos in the past, you may have known this excellent editing program. As Avid Media Composer is one of the most popular video editing programs, so many Canon XF705 users choose to edit Canon XF705 H.265 files with Avid Media Composer, but there are many users have reported that Avid Media Composer can’t support Canon XF705 H.265 files smoothly, and they want a quick solution to solve this issue. Why Avid Media Composer can’t support Canon XF705 H.265 videos smoothly? It is because Canon XF705 recorded videos are in H.265 codec, this codec is not native editing codec for Avid Media Composer, from Avid MC product page you will know Avid native supported format is DNxHD codec MOV format, so if you want to edit Canon XF705 H.265 files with Avid Media Composer smoothly, the best workflow is to convert H.265 MP4 files from Canon XF705 to Avid Media Composer DNxHD codec. we recommend you to choose Acrok Video Converter Ultimate to convert videos from Canon XF705 to Avid Media Composer DNxHD codec, this is the best H.265 to DNxHD converter on the market, it can convert HEVC H.265 videos recorded by Canon, Sony, Panasonic, etc. to DNxHD codec for Avid Media Composer native editing, besides the DNxHD codec for Avid, there are a lot of output formats in this Canon XF705 to Avid Media Composer converter, you can choose output formats as you want. Now please follow the content below to convert H.265 to DNxHD codec for editing with Avid. Convert MXF videos and H.265 videos recorded by Canon XF705. Convert 4K and 1080p videos recorded by Canon, Sony, Panasonic or other cameras. Optimized output formats for editing software. Many presetted formats for playable devices. Step 1. Download Acrok Video Converter Ultimate, install this H.265 video converter program on your computer, run it you will see the main interface. This Canon XF705 to Avid Media Composer converter software can help you to convert Canon XF705 H.265 videos on Windows or Mac. Step 2. You can directly drag and drop Canon XF705 H.265 videos into the software, or click “Add Files” button on the top left corner to load the videos, batch loading and converting is well supported by this Canon XF705 to Avid Media Composer converter. Step 3. In this Canon XF705 H.265 video converter, choose Avid Media Composer DNxHD codec for output. 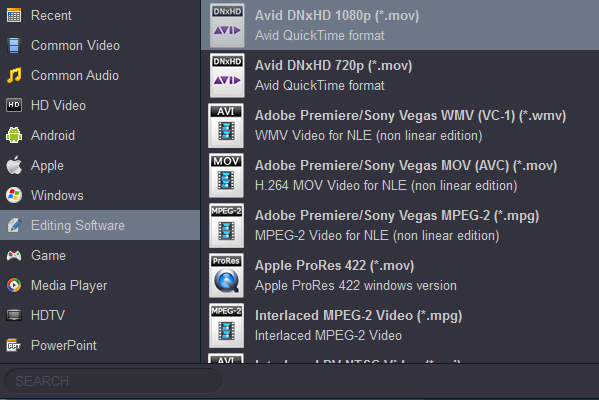 Just click format column and choose “Editing Software -> Avid DNxHD (*.mov)”, this is the best video format for Avid Media Composer, you can also choose other formats according to your need, there are many optimized output formats in this H.265 video converter. Step 4. If you want to adjust the output parameters before you convert H.265 videos from Canon XF705 to Avid Media Composer, you can click Settings button on the main interface and then adjust the resolution, codec, bitrate, frame rate or others according to your need. Tip: This powerful H.265 to DNxHD converter also has easy-to-use video editing feature, if you want to edit Canon XF705 H.265 videos before conversion, you can click “Edit” button, and then you can trim Canon XF705 H.265 videos, crop Canon XF705 H.265 videos, add watermark to your videos, adjust effect of the Canon XF705 videos, etc. just use them as you want. Step 5. This is the last step, just click convert button on the main interface of Canon XF705 H.265 video converter, Canon XF705 H.265 to Avid Media Composer conversion will begin. Acrok Video Converter Ultimate will convert Canon XF705 H.265 videos to Avid Media Composer native supported DNxHD codec immediately, just wait some time, when the conversion is finished you can load converted Canon XF705 videos to Avid Media Composer software for editing natively, and you won’t have any issues, and there’s no need to render the Canon XF705 videos again. Now just take a try on this Canon XF705 to Avid Media Composer converter, it will help you.